Even if this time it has come rather late, if there is a blog post that I am looking forward to write each year is this one. Few things can give you more pleasure than helping others (1). And in doing so I try to be as public and noisy as I can, hoping that I may serve the causes we contribute to also from the awareness point of view. How often do you use the #Wikipedia? Remember: It was sad to learn that @HansRosling passed away earlier this year. Nous sommes "Avec les personnes prostituées, Contre le système prostitueur!" Why am I “noisy” or public about these donations? I know that between 100 and 200 of you will read this blog post. I bet with any of you that at least 50% of you will be compelled to take a look at some of these organisations above, 10% of you will consider making a donation. Do you dare thinking that 1% of you won’t actually make such donation? I learnt about Kiva from Bruno back in 2009. Started contributing to Médecins Sans Frontières in 2010 after a conversation with Juan a couple of years before. I learnt from Slavery International at a temporary exhibit at the Museum of London. I started contributing to the sustaining of the Wikipedia after a tweet from Amalia. Discovered the Fundacion Hombres Nuevos thanks to my father’s 6-month volunteering in Bolivia. Learnt of Gapminder in TED. I started donating myself happiness with Fundacion Khanimambo after Nacho and Alberto. I started supporting to cancer research in part as a way to honour late friends and family members and encourage work colleagues going through therapy. I received the #IceBucketChallenge from Alvaro and Teresa. Avocats sans Frontieres and Movement du Nid were are ideas from Luca, the latest addition to the list being SOS-Racisme. After most of the causes there has been someone who let me discover them. If not one of those, I am sure that you will be able to find a cause, a NGO which resonates with you. Do yourself a favour and contribute to it. It can be just 25$, the cost of diner at a restaurant. You’ll feel much better. (1) See this article from the World Economic Forum “Why being generous is good for your health“. (2) You may check out similar posts I wrote about our contributions to NGOs in 2016, 2015, 2014, 2013 and 2012. If there is a blog post that I am looking forward to write each year is this one. Few things can give you more pleasure than helping others (1). And in doing so I try to be as public and noisy as I can, hoping that I may serve the causes we contribute to also from the awareness point of view. How often do you use #Wikipedia? I learnt about Kiva from Bruno back in 2009. Started contributing to Médecins Sans Frontières in 2010 after a conversation with Juan a couple of years before. I learnt from Slavery International at a temporary exhibit at the Museum of London. I started contributing to the sustaining of the Wikipedia after a tweet from Amalia. Discovered the Fundacion Hombres Nuevos thanks to my father’s 6-month volunteering in Bolivia. Learnt of Gapminder in TED. I started donating myself happiness with Fundacion Khanimambo after Nacho and Alberto. I started using the support to cancer research as a way to honour and encourage work colleagues going through therapy. I received the #IceBucketChallenge from Alvaro and Teresa. The latest additions, Avocats sans Frontieres and Movement du Nid, are ideas from Luca… and so on. After each cause there is someone who let me discover them. (1) See this recent article from the World Economic Forum “Why being generous is good for your health“. (2) You may check out similar posts I wrote about our contributions to NGOs in 2015, 2014, 2013 and 2012. Today, March 8th it’s International Women’s Day. In the last few days I have seen a significant buzz in social media about the day. In particular I read a couple of pieces that made contribute to the buzz with this post. I liked the approach: “What’s in it for me?” (from the perspective of men, of course) (1). There are three basic concepts underlying the Global Gender Gap Index, forming the basis of the choice of indicators, how the data is treated and the scale used. First, it focuses on measuring gaps rather than levels. Second, it captures gaps in outcome variables rather than gaps in input variables. Third, it ranks countries according to gender equality rather than women’s empowerment. I attach below a screenshot showing the top 30 countries in the list. 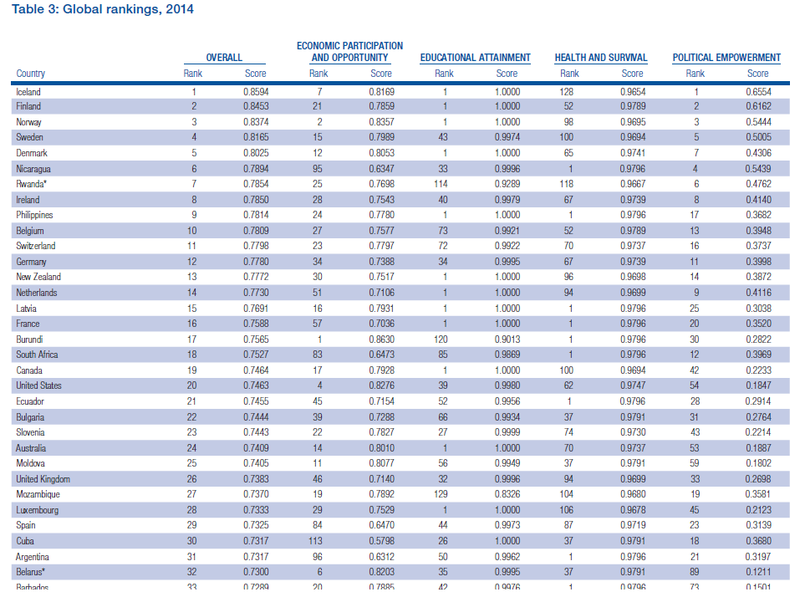 Global Gender Gap Index, 2014 ranking, top 30 countries. Scandinavian countries are in the top of the list (no surprise here). Some readers will wonder about the top places occupied by Nicaragua, Rwanda… read again the methodology above: “it focuses on measuring gaps rather than levels”. When I see this kind of indices, for personal reasons I focus on the positions occupied by: Denmark #5, Germany #12, Netherlands #14, France #16, Spain #29, Lithuania #44. A curiosity: Spain #29 vs. Cuba #30. No surprises either at the bottom of the list: Bahrain, Turkey, Algeria, Ethiopia, Oman, Egypt, Saudi Arabia, Mauritania, Guinea, Morocco, Jordan, Lebanon, Ivory Coast, Iran, Mali, Syria, Chad, Pakistan, Yemen… which they all have in common that are located in arid subtropical zone and that most of them have at least one letter a in the name. Human Development Index vs. 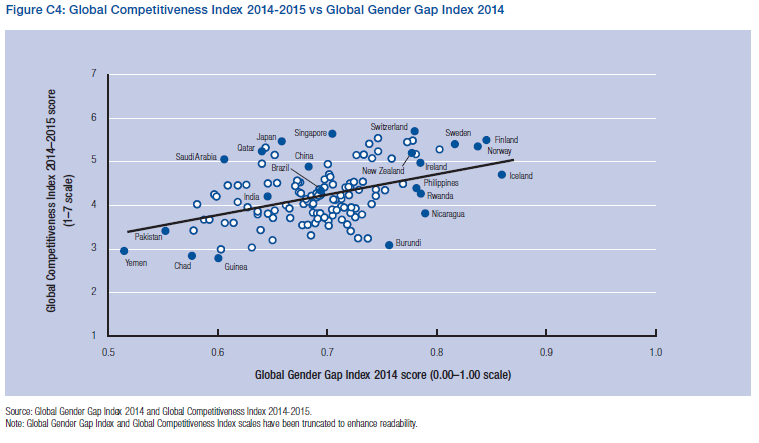 Global Gender Gap Index. Global Competitiveness Index vs. 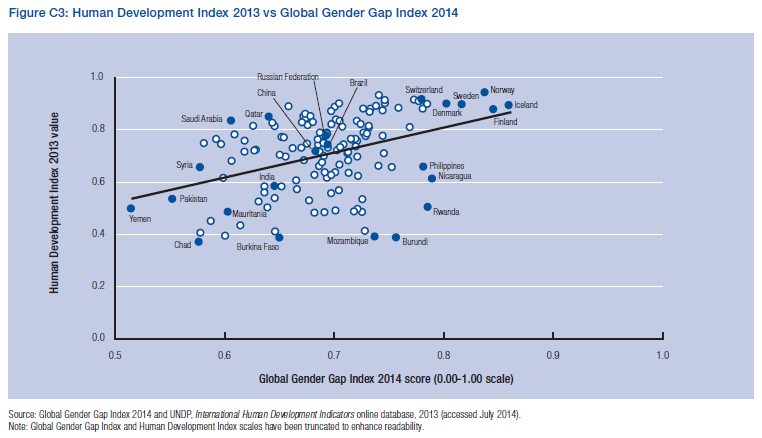 Global Gender Gap Index. We need you to listen. When we tell you about a problem, we don’t want you to jump to a solution for us. We just want to say it out loud to solve it ourselves knowing that you will support us. We need you to talk. To raise the issue of gender. Don’t worry about saying the wrong thing. Saying the wrong thing is better than saying nothing at all. It’s the only way to start the conversation. 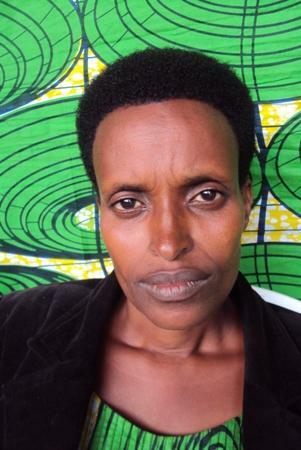 By visiting Kiva.org/Dreams, you can back a dream by choosing a woman whom Kiva should lend $25 to. There is no cost to you. By choosing her, you help her to follow her dream of starting or growing her business, sending her children to school, and ultimately, gaining financial independence. When women have the resources to make their dreams a reality, the world changes. More children go to school, more food is grown, and nations are more peaceful and prosperous. A case in point: if women farmers had equal access to farming assets and finance, they could increase their crop yields up to 30% and 150 million people who go hungry every day would be able to eat. Together we can make dreams a reality for thousands of women around the world. So in honor of International Women’s Day and the power of women, back a dream at Kiva.org/Dreams. My suggestion: visit the site of Kiva, filter by Yemen, the country at the very bottom of the list and help dreams come true, gender gaps close and turning around the situation. (1) I like the approach for its different persuasion approach, not like the closing the gap out of equal treatment, fairness, justice… wasn’t engouh. If there is a blog post that I am looking forward to write each year is this one. Few things can give you more pleasure than helping others. And in doing so I try to be as public and noisy as I can, hoping that I may serve the causes I contribute to also from the awareness point of view. I know that between 100 and 200 of you will read this blog post. I bet with any of you that at least 50% of you will be compelled to take a look at some of these organisations below, 10% of you will consider making a donation. Do you dare thinking that 1% of you won’t actually make such donation? Kiva, Médecins Sans Frontières, Oxfam, Slavery International, Wikipedia, Fundacion Hombres Nuevos, Gapminder, Fundacion Khanimambo, American Association for Cancer Research Foundation and the new addition of 2015 Avocats Sans Frontières… those are the causes I decided to support this year. If not one of those, I am sure that you will be able to find one which resonates with you. Do yourself a favour and contribute to it. It can be just 25$, the cost of diner at a restaurant. You’ll feel much better. (1) You may check out similar posts I wrote about contributions to NGOs in 2014, 2013 and 2012. I take for granted that most people are to some extent concerned by others and many contribute in different ways to alleviate others’ burdens. Some find it that these contributions should rather be kept private. In this regard, I take the opposite approach. I try to be as public as I can, hoping that I may serve the causes I contribute to also from the awareness point of view. Take this blog post as an example. I expect that it will be read by over 100 people. If just a reader feels compelled by the message and decides to look for a cause to contribute to, the time spent by me writing this post will have been worth it. AACR, the last organization I decided to support. Kiva, Vittana, Oxfam, MSF, Slavery International, Wikipedia, Fundacion Hombres Nuevos, Gapminder, American Association for Cancer Research Foundation… those are the causes I decided to support this year. If not one of those, I am sure that you will be able to find one which resonates with you. Do yourself a favour and contribute to it. It can be just 25$, the cost of diner at a restaurant. You’ll feel much better. (1) You may check out similar posts I wrote about contributions to NGOs in 2013 and 2012. I got to know about Kiva from my friend Bruno at the end of 2008. I immediately liked the idea and I gave my first loan through it soon after, in January 2009. The idea is very simple: giving micro credits via internet to small entrepreneurs in developing countries. Kiva facilitates the process establishing a website to channel the funds and creating network with local organizations which will disburse the money and collect repayments. The fact that I have given 101 credits of 25$, doesn’t mean I have dedicated 2,525$ in these 4 years. I have dedicated to Kiva just above 550$. With them I was able to lend and re-lend up to above 100 credits. Now I still have close to 400$ in outstanding credits (being re-paid), after having donated some 130$ to Kiva to help with their operating costs and having lost just 28.19$. I want you to take a second to think what do those 28$ lost mean. 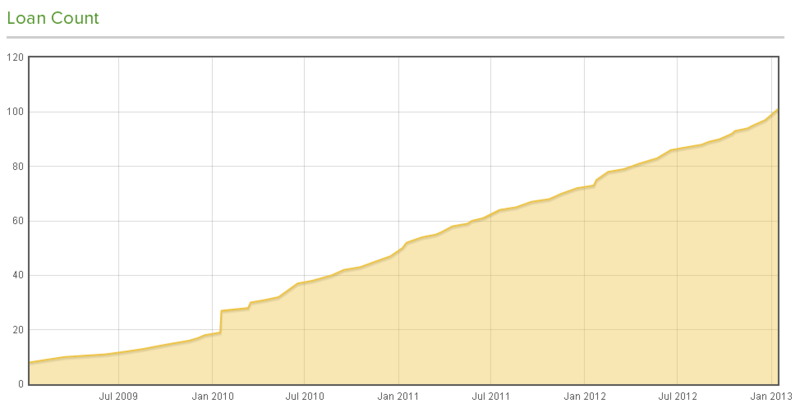 The default rate along these 4 years in my case has been 1.5%, this is close to nothing. Take into account Western countries mortgage default rates: close to 10% in Spain, and though lower in USA it reached over 5% a few years back. Of all the loans that should have already been paid (75) just 3 ended with a loss. In one I lost less than half of the 25$ and in other 2 thirds. The entrepreneurs came from Africa and I am not upset by not having gotten back 28$ from them. I just hope that their situation improved since the time they were forced to default. With the 3rd credit which ended in loss, I lost 0.06$… due to currency exchange, meaningless. Do you want to know some more statistics? 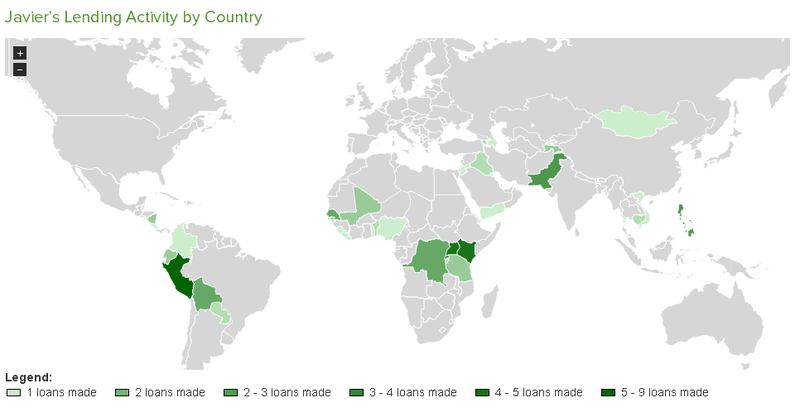 My “Lending by Country” map. In 67% of the cases the recipient of my loans are women (see Forbes article about higher ROI when investing in women). Regarding sectors: agriculture takes 30.7% of my credits, followed by food (22.8%), manufacturing (13.9%), retail (10.9%), education (6.9%)… (I would like to give more credits for education, but within Kiva there are not so many displayed; to cover that need I collaborate with another organization, Vittana). I told you that I was introduced to Kiva by a friend. I also sent many invitations and some gift cards to friends; 6 of my friends accepted them.